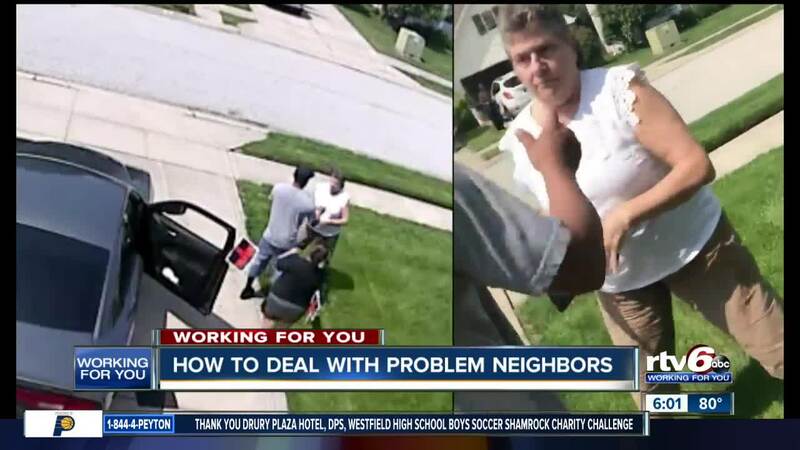 INDIANAPOLIS—A neighbor dispute caught on camera involving two northwest side homeowners has been viewed more than 178,000 times on the RTV6 Facebook page. Vicki New was arrested this week for criminal trespass and battery resulting in bodily injury after a neighbor’s video appeared to show New tearing up yard signs and threatening her neighbors. Prosecutors have not yet filed criminal charges, but New remains in police custody and is due in court on September 4. Although New’s spat with her neighbor Luvia Roman is on the extreme side, many Indiana homeowners have conflicts with their neighbors involving noise, property lines, dead trees, overgrown grass, or other annoying behavior. RTV6 reporter Kara Kenney went to talk to Lebanon attorney Kent Frandsen of the law firm Parr Richey. Frandsen is a lawyer of 40 years and has a lot of experience with neighbor and boundary disputes. “You have to use your property in a way to not unreasonably interfere with the rights of your neighbor," said Frandsen. Frandsen says you should first try working it out with your neighbor, and if that doesn't solve the matter, document the problem with notes, photos and videos. If you think it’s a code violation, such as overgrown grass, contact code enforcement. "Put some pressure on the landowner to mow the yard or clean up the trash out of the back and that is always something you can do,” said Frandsen. “I would encourage people to use those avenues before taking the law into their own hands." If things get scary or even physical, call the police and/or get a restraining order. Vicki New’s neighbor Luvia Roman said her neighbor called her employer Bone Dry Roofing to try to get her fired. Frandsen said that’s extreme for a neighbor dispute. “A remedy, in that case, would be a restraining order or a lawsuit for defamation or slander,” said Frandsen. The attorney said suing your neighbor to get an injunction or damages should be a last resort. “How much money do you want to spend fighting with your neighbor? Maybe you should find somewhere else to live," said Frandsen. Frandsen said having documentation can make a huge difference in court. “It depends on who the judge decides is the reasonable one, and the trick in this business is always to appear to be the reasonable one,” said Frandsen.